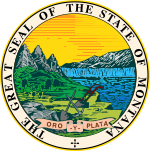 The 1980 Montana gubernatorial election took place on November 4, 1980. Incumbent Governor of Montana Thomas Lee Judge, who was first elected in 1972 and was re-elected in 1976, ran for re-election. However, he faced a stiff challenge in the Democratic primary from his lieutenant governor, Ted Schwinden, and he ultimately lost renomination. Schwinden, advancing to the general election, faced Jack Ramirez, the Minority Leader of the Montana House of Representatives and the Republican nominee. Although Ronald Reagan, the Republican presidential nominee, won the state in a landslide that year, Schwinden comfortably defeated Ramirez to win his first of two terms as governor. ^ a b "Report of the Official Canvass by County of the Votes Cast at the Primary Election Held in the State of Montana, June 3, 1980". Montana Secretary of State. Retrieved July 5, 2014. ^ "Report of the Official Canvass by County of the Votes Cast at the General Election Held in the State of Montana, November 4, 1980". Montana Secretary of State. Retrieved July 5, 2014. This page was last edited on 28 March 2019, at 05:49 (UTC).